Just what I needed. It was a snowy afternoon in Vermont and I was bored. I picked up Moderow’s Fast into the Night: A Woman, Her Dogs, and Their Journey North on the Iditarod Trail from the pile of books next to my bed. I started the memoir and then put it down. Why? I knew I wanted to settle into it, and have a chance to read a good chunk undisturbed. Dogs walked and fed. Snacks on a plate. PJs on. Glass of Malbec. Back to the memoir. And what an amazing memoir. What an amazing world she brought us into. Iditarod, the Alaskan landscape, the characters, the dogs, and her family’s support. Incredible. I pulled up the covers and kept reading. Moderow is passionate and compassionate. Her focus was constantly on the comfort and health of her team of dogs. She was so in tune with the needs of their individual needs and personalities. 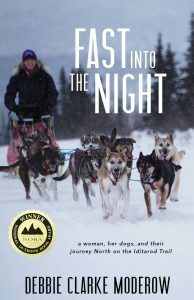 She wouldn’t put them in danger just to finish Iditarod. That would have gone against her integrity and heart. You have to respect her for that. Her goal was simply–if it could be simple–to complete the course with happy and healthy dogs. She tried twice, once in 2003 and again two years later. She finished with a healthy team in 13 days, 19 hours, 10 minutes and 32 seconds. Moderow captures her characters so well, the four and two legged ones, that we see her all the more clearly too. Moderow, even when struggling so intensely, carried on. This is bravery in action. She is such a role model for following your dreams without hurting others. Incredible, her internal and external journey. As you do, nothing unusual, right? Sheesh. I read on, huddled in my little bed with my two well-fed Huskie mutts on the end of my bed. No, we’d not be trying this ourselves. Iditarod is a challenge, obviously. There’s the physical conditions, but also there are the emotional hurdles she faced. There were times when she had to make potentially life-altering decisions when so completely drained and exhausted that clear thought was not easily grasped. What was best for each of her dogs? When should she ‘scratch’ even if the volunteers showed no compassion for her place and experience? I wanted her to make it. I knew she ultimately did from the blurb on the back, but I wanted to know how. How did she do it? What kept her going? You’ll have to read it yourselves if you want to find out how. Please do.